Beginning in 1988, Melbourne Art Fair was the first commercial fair of the Asia Pacific to establish a global network for collectors to connect with the contemporary Australian art scene. There are some critics who are stuck on the fact that the relaunched version is considerably down-sized and therefore devalued. My take is that is was more focused and showed how the Melbourne Art community remains enthusiastic about this event. Avec Pleasure was delighted to take part in the relaunched Melbourne Art Fair. It was exciting to explore all the diverse components of its new home in the Southbank Arts Precinct. The new MAF was split across two main venues; Vault Hall and Riding Hall situated alongside ACCA and The University of Melbourne’s Southbank Campus. The Collectors program was full of inspiring talks, keynote addresses, visits to artist’s studios and tours of the homes of Melbourne’s private collectors who generously opened their houses to show their collections. They share their enthusiasm for collecting and supporting contemporary Australian artists. The Collectors program was so rich in choices it was impossible to do it all but great fun trying. “Melbourne Art Fair relaunched 2-5 August 2018. The 15th edition of the Fair showcased a curated selection of 40 leading galleries and presented works by some of the newest and most respected contemporary artists from Australia, New Zealand and the region. As the flagship event of Melbourne Art Week… [30 July – 5 August] Melbourne Art Fair partnered with 50+ galleries and cultural institutions across Australia’s capital of culture to create a dynamic calendar of talks, tours, events and performances that celebrated contemporary art and living artists.” MAF publications / website. When you find an Artist whose Art Stops You in Your Tracks. My work with Avec Pleasure Art Tours and Consultancy has allowed me to be a regular visitor to many major Art Fairs within Australia and Internationally. It has been such a blast to learn about and be inspired by the contemporary Art Practice of so many talented artists. I can’t speak about everything I saw in detail, as there was too much and space won’t allow, however I do want to highlight the work of an artist new to me. 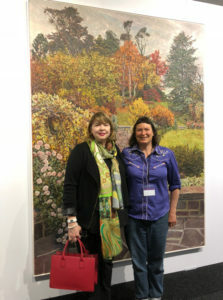 Last week I had the immense pleasure of meeting up with the passionate and charming Lucy Culliton who was spending most of the Melbourne Art Fair in the booth of her Brisbane dealer, Jan Murphy Gallery. Lucy presented a wonderful solo show of her latest botanical studies. When speaking with her about her art practice it became obvious that she is passionate about the country property she lives on and all the many natural elements which present themselves to her on a daily basis. For her solo show they selected a wide range of floral studies large and small. Excited about her new works she couldn’t wait to tell me that all her paintings are of actual flowers she planted in her garden at home. The technical skill with which she paints her much loved gardens is highly developed and the passion that she presents when discussing her works is reflected within the paintings themselves with an honesty of form and narrative that is unique and hard to find. I have to say, I fell in love with her paintings. Despite many other exciting artists whose works I viewed and enjoyed, I found myself returning for one more look, several times. Not surprisingly, Lucy sold almost every one of the smaller works on display and also one of her large paintings on opening night. If you’re lucky, every Art Fair has at least one new artist whose work jumps out at you and inspires you to find out more. This year, for me it was Lucy Culliton. 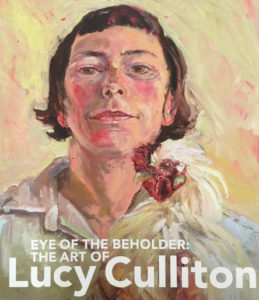 I went home and looked her up to discover that Lucy Culliton won her first award, the Conrad Jupiters Art Prize, in 1999, the year she graduated from the National Art School. 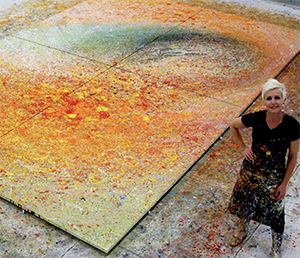 Since then she has continued to win prestigious Art awards including the Mosman Art Prize,and has been a regular finalist in the Archibald, Wynne, Sulman and Dobell prizes. Meeting her and hearing her talk spontaneously about her art practice was a delightful experience and I can’t wait to see her next exhibition of works. Discovering new artists who inspire us is one of the primary reasons for attending an Art Fair. The opportunity to purchase their work ensures their creative livelihood, and deepens our own appreciation of art.